I was walking my parent’s dog through the river walk, just above the viaduct, crossing the River Maun along Quarry Lane when I stepped on to a large, partly submerged stone in the river. Looking back to the bankside which was undercut from strong currents, and intertwined with tree roots built up over many years, I happened to notice a very slight clay colour, deep under the bank and locked with roots with what appeared to be a man made mark on. And after much pulling and manipulating of the said object the attached image appeared. Wary of the fact that it could have been washed there with strong currents from more recent times, but thinking it highly unlikely due to it’s not inconsiderable weight, and the fact that I don’t know of any electricity companies that would go to such lengths as to have clay bricks produced with their name on it, I wondered if it could possibly span back to the construction of the viaduct itself? Hi, I’ve just found one of these tiles at a 1930s house I’m renovating in Staffordshire. Does anybody know what the indents were for on the top of the tile – were the tiles linked using some form of pegs in these slots / holes? I have a Baldwin electric cable brick . It came from a building site I worked on in Reading. The site used to have factory’s on it then it was a car park then I helped build acomadation units for Reading university on it, the brick itself was at the bottom of a 200 + year old wall wich was near our bricklayer tea cabin. These tiles where indeed used to cover buried services,ie electricity cables,so as to avoid the cable being spiked or punctured from above.Nowadays a roll of polythene ribbon bearing the name of the service,ie gas,electric,cctv etc is laid over to alert the digger to the hazard.Hope this helps. Hello Berisford & Liz, many thanks for the help… it’s always interesting to hear the background on something, much appreciated. Yes, it’ll be quite old Stephen, but also quite common. 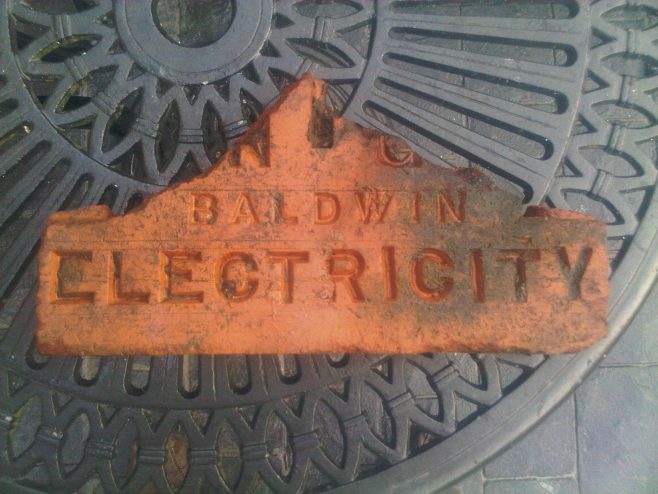 It part of a brick cover laid along buried electricity cables to stop you putting your spade through the cable. Blaskeys Wallpaper & Paint, Market Place Mansfield. Bradder Street . The Builder . East Midlands Gas Board, Emgas Lime Tree Place, Mansfield. Handley Arcade in Days Gone By. How were the shoes made? Images relating to James A. Taylor Ltd. A bit of a Mystery! Inside the Old Lord Byron. John William Kaye The Younger. Mansfield Flood in a Pub!